The meeting of the Committee was attended by Mr. Eduard Biriucov, Secretary General of the PS IGC TRACECA, Mr. Legenkiy, TRACECA National Secretary in Ukraine, representatives of the national authorities of beneficiary countries, representatives of the European Commission as well as experts of the project. The Steering Committee heard the report of the Team Leader of the project on the progress of the project within the past six months, and a plan of activities for the next six months. 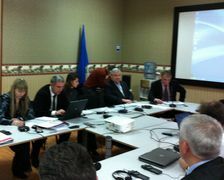 The Committee approved the Progress Report #4 of the project. As part of the roundtable, the parties discussed the results of the study tour to Manchester, as well as future tours to the civil aviation facilities in Cologne, Paris-Toulouse, and Poland. In his speech, Secretary General noted the mobility of the project and willingness to provide technical assistance for the preparation of national authorities to audit by ICAO in Armenia and Moldova, the implementation of short-term technical assistance missions in the field of aviation safety in Ukraine within the framework of preparations for Euro 2012, technical assistance in the field of environmental safety for beneficiaries of the project. He also emphasized the efforts of the project to coordinate its activities with the organizations and projects of mutual interest: TEN-T project, coordination with European and North Atlantic Office of ICAO, "Twining" project team in Georgia and Ukraine. Mr. Biriucov expressed his opinion on the successful implementation of all planned modules of technical training, awareness raising programs and communications. Joint cooperation in achieving common goals of civil aviation authorities of the beneficiary countries determine the possibility of a constructive solution of current problems and effective implementation of tasks assigned to aviation.